Only in a group with mothers of other victims can you find real comfort. Wow - what a read this book was! First One Missing by Tammy Cohen is an intense psychological thriller with plenty of twists and turns to keep you turning page after page. Focusing on the families of the victims, large chunks of the story are also told from the perspective of Leanne, a policewoman who is the Family Liaison Officer for one of the families in the case. I liked the fact that First One Missing takes a slightly different angle to many other books in the genre, by spending most of the story focusing on the impact the murders had on each member of the family, and how they were all struggling to come to terms with the horrifying reality of losing a daughter, a step-daughter, or a sister. These are all things that you don't necessarily consider when reading thrillers - instead, the reader is usually drawn to the killer's motives and reasoning, the terror of the victim, or the detectives trying to piece the case together clue by clue. First One Missing takes this common trope and instead, thinks of the wider picture and how the murders would affect everyone involved in the case. For me, this emotional context to the story is what really made it stand out - I have no doubts that this story won't be forgotten in a hurry! I was instantly hooked from the very beginning, despite the surprisingly slow pace of the storyline. The author is an expert in slow-building suspense, keeping you engaged while carefully laying the trail of breadcrumbs that eventually leads towards the end of the book. It's smart, it's unexpected, and it's very well thought out - all the best qualities of a top-quality psychological thriller. First One Missing is my first Tammy Cohen novel, but I have no doubt that it won't be the last I read! First One Missing is available to buy now. 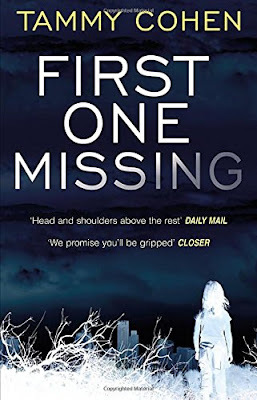 Have you read First One Missing? Let me know in the comments below!